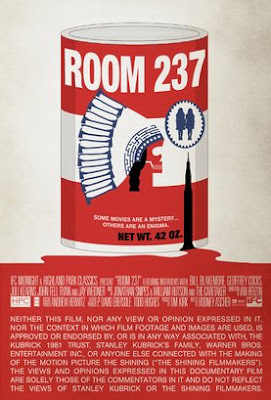 "Room 237" (2012) is a documentary exploring the hidden subtexts, meanings and conspiracies within Stanley Kubrick's horror movie "The Shining". Stanley Kubrick's "The Shining" (1980) is a visual masterpiece. The hotel's interior is filled with different patterns and puzzles in which many an obsessive fan has looked for meaning. 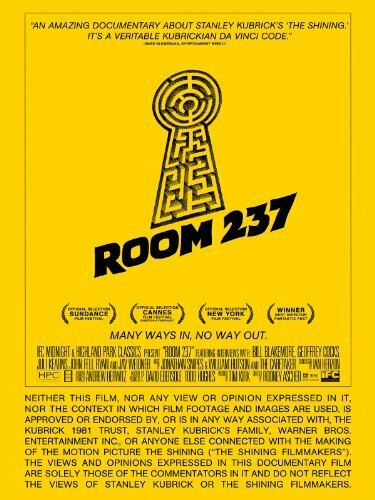 This documentary, showing scenes from the movie and from other movies while off screen fans talk about the hidden meanings within the movie. 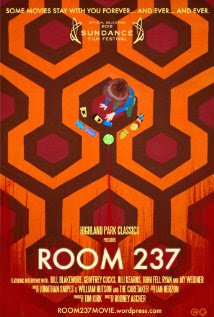 For those of you that don't remember, room 237 refers to the room in the film's Overlook Hotel that had the naked corpse woman in the bathtub that attacked Danny and tried to seduce Jack. These fans and conspiracy theorists see vastly different things in Stanley Kubrick's film. One sees the director commenting on the white man's genocide and displacement of Native Americans as proven by the fact that the hotel is supposed to be built on Indian burial grounds and because of the prominent placement of cans of baking soda that have an Indian's head on them. There's also the theory that Kubrick was commenting on the Holocaust and genocide of the Jews. One theorist believes Kubrick has left clues that he was involved in the US Government's conspiracy to fake the moon landing in 1969 and that the filmmaker filmed the moon landing footage on a movie stage. Watching this documentary and listening to the people that have invested so much time into the study of this film you are bound to be interested in what they are thinking and some of the hidden "clues" do seem to make sense in the context of what they believe but they could also mean many other things or be nothing more than something the set designer had available and placed on set. Who knew there was so much thought put into the hidden meanings of the film? It's too bad the director is no longer with us to confirm or deny these hidden meanings but I guess that would take all the excitement out of solving the unsolvable. I really want to see this. I love The Shining.